Gamasutra - Press Releases- Sin and Sacrifice, the new DLC for Battlestar Galactica Deadlock, is now out! Sin and Sacrifice, the new DLC for Battlestar Galactica Deadlock, is now out! Never in the history of the Twelve Colonies have so many sacrificed so much. Even as Colonial Fleet holds the Cylons at bay, the toll of the war continues to climb. But something has changed. Rumours of an awakening, whispers of a name: Lachesis. Battlestar Galactica Deadlock is back with a new expansion! In Sin and Sacrifice, the epic story of Deadlock continues and brings with it an exciting conclusion to the Season One storyline. A brand-new campaign with 11 story missions set after the original Deadlock campaign and Operation Anabasis. Loyalties will be questioned. Resolves will be tested. And for Lucinda Cain, Rear Admiral of Colonial Fleet, not all threats come from outside. Sin and Sacrifice writes new pages in the lore of the Battlestar Galactica universe and tells the story of one of the most critical junctures of the First Cylon war. New missions, new ships, a new enemy, but also the Colonial Fleet radio chatter voice pack: a new radio chatter system featuring over 1,100 unique recordings injects more drama and tension into the combats of Battlestar Galactica Deadlock, bringing your knife-edge encounters to life. Radio chatter is present both in combat and during your cinematic replays, making your Battlestar Galactica fleet experience even more immersive. Do you want to go through the entire Battlestar Galactica Deadlock Season one? Watch the new Story trailer! Since Day One, back in 2017, Battlestar Galactica Deadlock grew greatly and widely. The "Season One" includes the base game and four DLCs: new units, the "civil war" situation, new campaigns, the new survivor mode and now the final chapter for the Season. Also, lots of improvements reshaped the full Battlestar Galactica Deadlock gameplay experience. 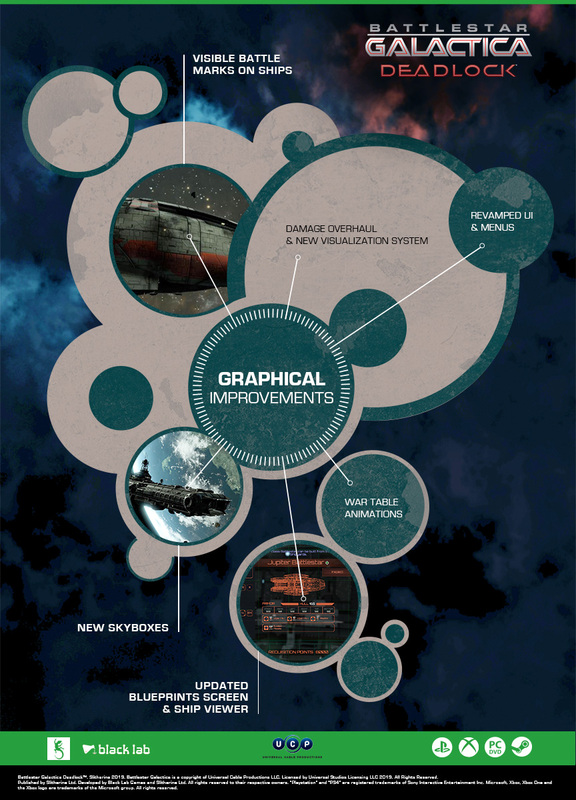 In the following infographics, you will be able to see all these improvements at a glance! 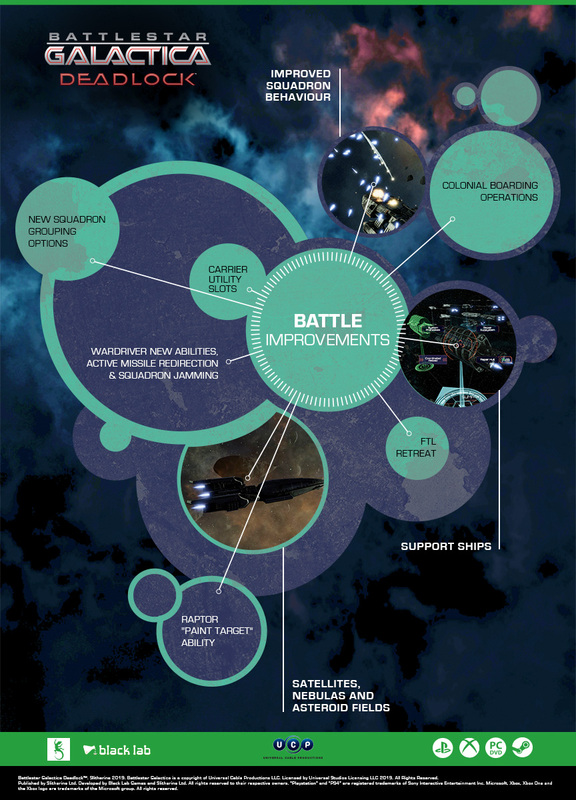 New improvements include crew "veterancy" system, the radio chatter and persistent ship damage between missions. Visually, a lot has been added: major upgrades include new skyboxes, war table animations, visible marks on the ships when hit. All battle improvements now available in the "Season One" Battlestar Galactica Deadlock: support ships, boarding operations, new grouping actions, and more! Sin and Sacrifice materials - So say we all! Sin and Sacrifice, the new Battlestar Galactica Deadlock DLC, is now out on PC and Xbox One. PS4 version will be available soon.